Do you know why the ministers are saying these? There is something that the government is not telling you, but it’s all summed up in that one sentence by Khaw. Take a look at the unemployment statistics. 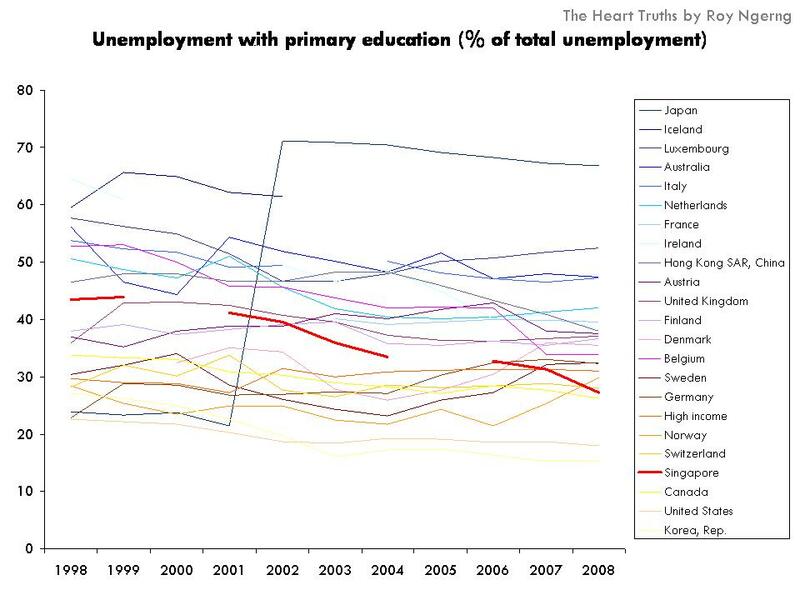 Do you know that for Singaporeans with primary education, the unemployment rate has been steadily going down (Chart 1)? For Singaporeans with secondary education, the unemployment rate had remained at a consistent low – and actually the lowest among all the high-income countries (Chart 2). 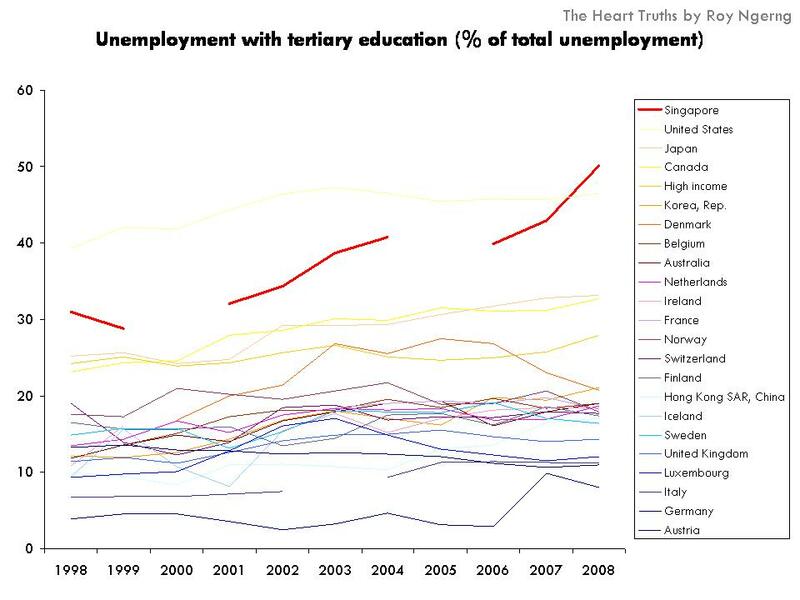 But take a look at Singaporeans with tertiary education – the unemployment rate among Singaporeans have shot up to be the highest among all the high-income countries (Chart 3). And if you look back all the way to 1985, you can see that the unemployment rate among tertiary-educated Singaporeans have been on the upward trend since 1985 – from having one of the lowest unemployment rate among tertiary-educated Singaporeans, we now have the highest unemployment (Chart 4). 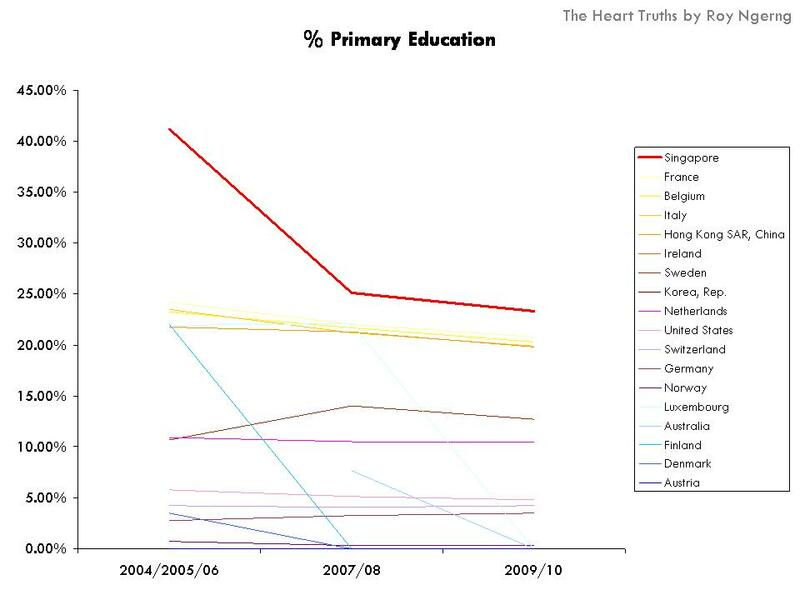 If you look at the proportion of Singaporeans who have primary education, the proportion has actually dropped – which might explain the decline in unemployment among primary-educated Singaporeans (Chart 5). You would see that the proportion of Singaporeans who have secondary-education has remained constant, which would explain the consistent unemployment trend (Chart 6). Finally, when you look at the proportion of people in Singapore who have tertiary education, you can see that the proportion of people here with tertiary education actually shot up dramatically (Chart 7)! Does this thus explain why there is also a dramatic rise in the unemployment rate among tertiary-educated Singaporeans as well? 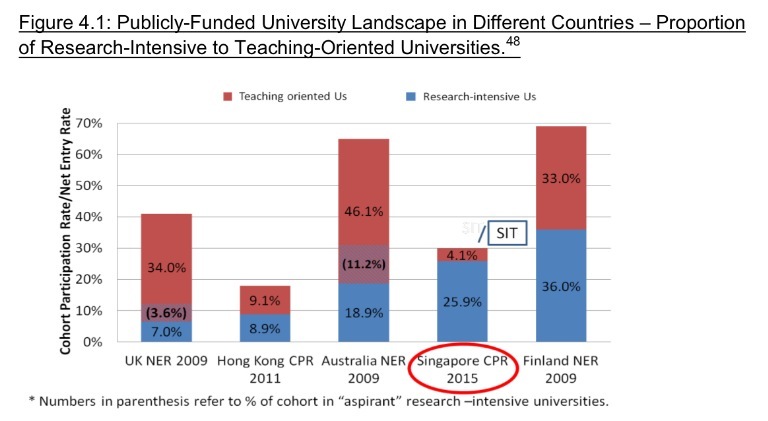 Quite obviously, since a higher and higher proportion of Singaporeans are receiving university education (Chart 8), this might have contributed to the rise as well. But what could the more plausible reasons be? 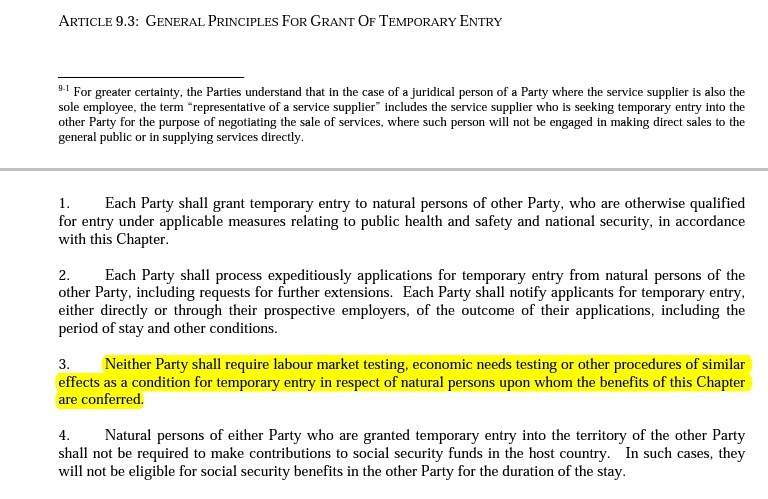 First, as I had discussed before, do you know that in the Comprehensive Economic Cooperation Agreement (CECA) Between The Republic Of India And The Republic Of Singapore, there are clauses which allow easy access for foreign workers from India to work in Singapore, because Singapore is not allowed to “require labour marketing testing” for the entry of these workers (Chart 9). So, do you know where our jobs are going now? Of course, it would not be illogical to assume that India would not be the only country where such clauses exist to protect foreign workers over Singaporean workers. Of the other agreements that Singapore had signed with the other countries, which other agreement would also allow for such an easy entry for their workers to compete with the Singaporean workers in the job sector of “managers, executives or specialists”? Second, do you also know that when companies would like to hire workers on Employment Passes (E Pass), do not need to pay additional levies on these workers or adhere to any quota (Chart 11)? To qualify for the E Pass, foreign workers are required to “earn at least $3,000“. This means that workers on E Passes would directly compete with Singaporean university graduates, whom starting pay is $3,000. But as I had written previously, this “framework” doesn’t have any bite because the MOM had said that it “does not review the merits of a firm’s hiring decision, as the firm is best placed to decide on which candidate can do the job“. Essentially, this “framework” does not fundamentally change the nature of hiring practices in Singapore. Employers are still allowed to advertise on different platforms on job openings, they are still allowed to interview foreigners at the same time with Singapore, or even foreigners only, and they are allowed to hire foreign workers without any justification. Finally, as I had discussed in an article earlier this week, the PAP government is bringing in a massive influx of foreign students on scholarships – 52% of the foreign students are on scholarships. Are the rest of the 48% also on some form of financial assistance? Also, “Upon graduation, scholars are obliged to work in Singapore or Singapore companies for up to six years,” which again is competition with the Singaporean university graduates. The question to ask is – if there are also deserving Singaporean students for scholarships, why is it that only less than 6% of Singaporeans are on scholarships, when 52% of foreigners are on scholarships? And if there is already a saturation of degree holders in Singapore, shouldn’t the PAP government focus on grooming the students in Singapore instead of creating a glut of degree holders in Singapore, by importing even more students into Singapore? This is no wonder that Lee, Khaw and Chan would go to such great extent just to convince Singaporeans that a polytechnic diploma is a more viable “option” than a university degree. And so, they have proclaimed in unison that polytechnic diplomas are good on their own right. However, what is the problem here? But why is this worrying? In a previous article, I had written about how Singaporeans would need to earn at least $2,000 to have a basic standard of living in Singapore. 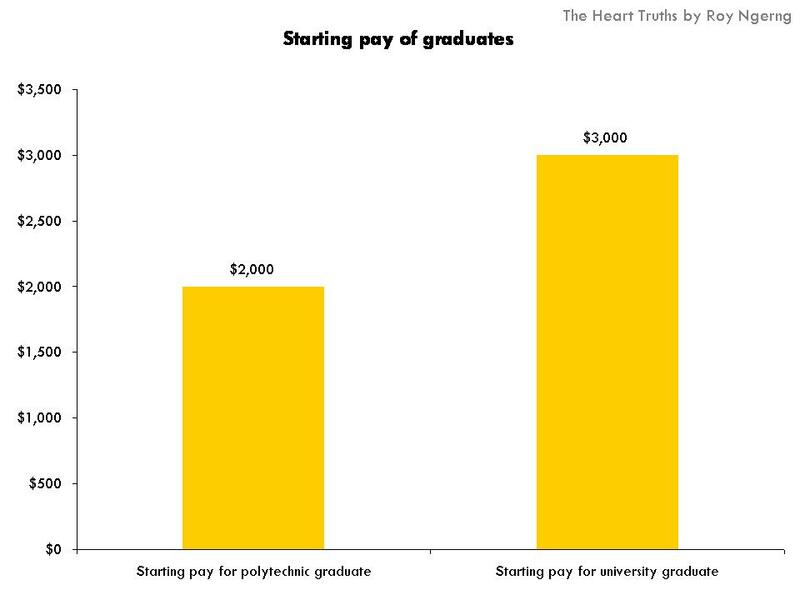 At a starting pay of $2,000, polytechnic graduates are barely scraping by. Also, I had estimated that the proportion of Singaporeans living in poverty is 28% – the poverty line has been defined by the National University of Singapore Social Work Department as being half of median income, or $3,000. This means that at the poverty line of $1,500, polytechnic graduates are earning just above the poverty line. Of course, for Singaporeans without a degree or diploma, you can imagine how worse off life can be for them in Singapore. But what is also of concern isn’t just the starting pay of polytechnic graduates, but of how their pay will pan out over their lifetime. 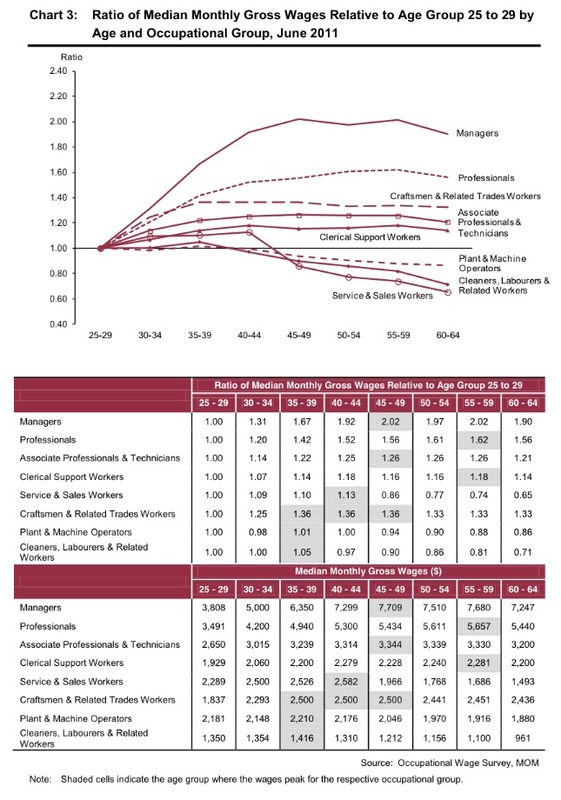 If you look at the chart below, for wages which start at around $2,000, or the starting pay of a diploma graduate, you can see their as the workers who receive this pay grow older, their pay would either stagnate or decrease. This means that for polytechnic graduates, they would be forever making barely enough to scrape by. However, what about degree holders? Their wages will rise dramatically over their lifetime. This is worrying because “30% (of students in Singapore would progress) to the junior colleges (and mostly to university), 40% to the polytechnics, 20% to the ITE, and 3 to 4% to the private education organisations. 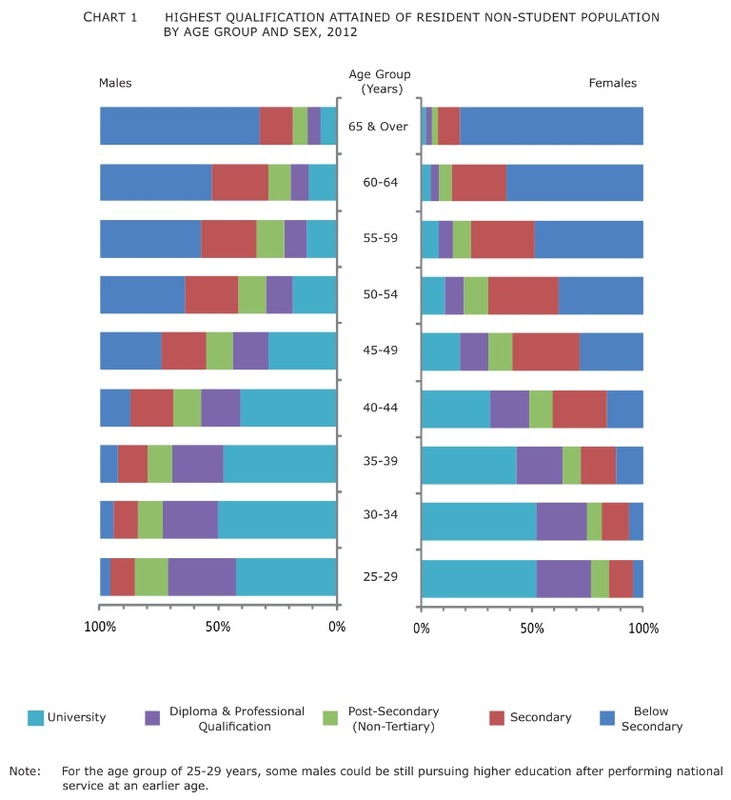 This means that only 30% of Singaporeans with the highest likelihood of entering university will ever see their lot get better in life – because of the higher pay, whereas for the rest of the 70% of Singaporeans, they will struggle to barely survive, or not even be able to survive adequately in Singapore. But already, Singaporeans are paid the lowest wages among the high-income countries. What this means is that even the wages of degree holders are already being depressed. If the wages of diploma holders are even lower, this means that the wages of diploma holders are even more severely depressed! Indeed, for Singaporeans to be earning wages that are in tandem with the cost of living in Singapore, we should be earning a median pay of about $6,000, or twice the current median wage – similar to that of the other similarly high-income countries. This would mean that degree holders should have a starting pay of $6,000, and at the current peg, that diploma holders should be earning $5,000. Yet, does this mean that the university population in Singapore cannot go on increasing? If you compare Singapore’s university cohort participation rates (on an annual basis) with the other countries, you would see that Singapore has a relatively much lower participation rate (Chart 14). So, there is indeed room to increase the university enrollment for Singaporeans in the Singapore universities. It is thus perplexing why there is a sudden about turn by Lee, Khaw and Chan to encourage Singaporeans not to pursue degrees. But the other important question is this – it is not just whether Singapore should produce more university graduates but whether our graduates have the skills and flexibility to work in the labour market? Indeed, the Ministry of Education has also recognised the need for the education system to “incorporate a broad-based education into higher education to develop higher order thinking and soft skills,” as well as to emphasise “on the importance of multidisciplinary learning and critical thinking skills that would better equip students for the future”. 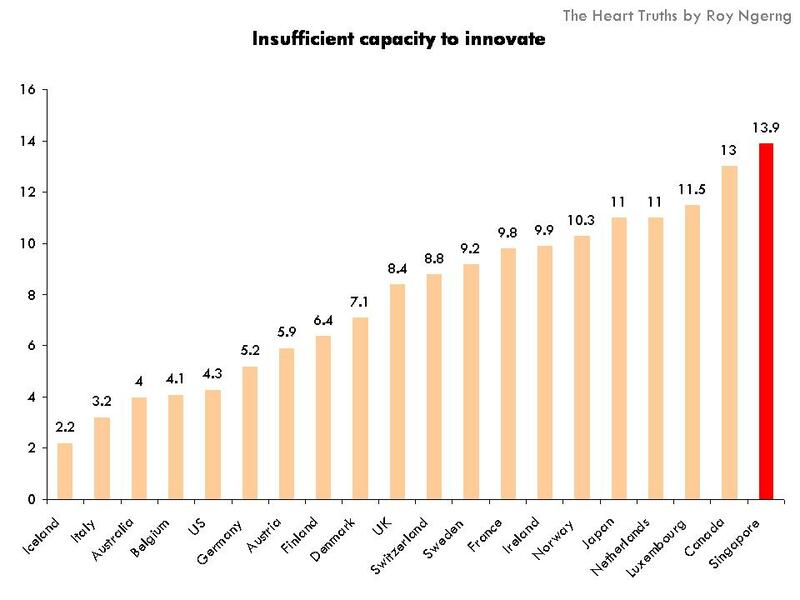 In fact, most damningly, in the The Global Competitiveness Report 2013–2014 report, when compared to the other high-income countries, among the “most problematic factors for doing business”, a higher proportion of employers voted on Singapore as having the most insufficient capacity to innovate (Chart 16). 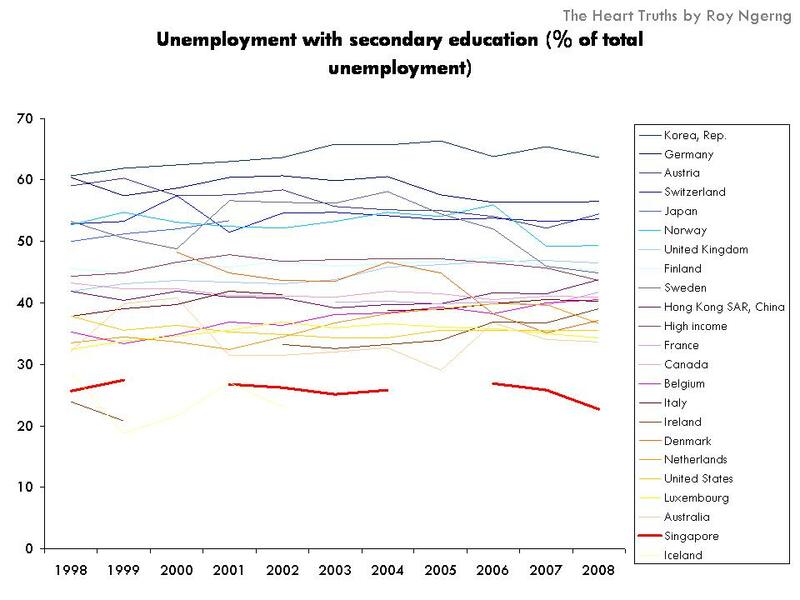 Evidently, the increasing unemployment among tertiary-educated Singaporeans is due to several factors. If the agreements that Singapore had signed with other countries and the labour policies enacted can be exploited through the inherent loopholes, then the solution is to ensure that the agreements and labour policies provide stringent protection for Singaporean workers. However, it is clear that the PAP government is resistant to do so. As such, they have decided to take the easy way out to persuade Singaporeans not to take university degrees. But this is at the expense of educating your own citizens and strengthening the local core and pool of tertiary-educated Singaporeans. It is surprising that the PAP government would be willing to compromise on the people’s education and Singapore’s long term future – a core population that is weakened in their education will threaten the foundation that prop Singapore up. In persuading Singaporeans not to pursue university education, the PAP government has also chosen to sideline the issue of wages. If Singaporeans do not pursue a university education, the wages that they would receive for the rest of their lifetime would be barely sufficient for a respectable standard of living in Singapore. The question is, why are wages and job types structured along only educational lines – such artificial demarcation will only entrench the differences and thus wage differentiation, and result in growing disparity, as has happened in Singapore. There is a need to relook how wages are pegged at, and the weightage their education qualifications should play in this. Again, is the PAP willing to do so? Finally, as the MOE had also realised that there is a need to provide “multiple progression pathways and options for students, making the institution more attractive to prospective applicants“. Instead of the PAP ministers saying that Singaporeans should opt not to enter universities, the more apt response would be to look at how universities can be made more relevant to the needs of Singaporeans and to the job market. The MOE had noted that, “in Finland, the government expanded the higher education sector by creating a distinct tier of polytechnics/universities of applied sciences (UAS),… (where) their mission was clearly defined as providing vocational and professional training for labour market and industry needs… Students would typically graduate with a Bachelor degree after three to four years of study.” Thus there is a need to relook our understanding of what a university education means, and how it can be redesigned to not only expand the opportunities for Singaporeans, but to ensure that a university will continue to be relevant to the job market. The PAP’s government’s convulated policy is to extend tuition grant to foreign students who work three years in any local firm after they graduate. This is a source of cheap tertiary labour, subsidized by our people, to compete with our people so that local companies, including GLCs no need to pay so much to employ graduates. See how business friendly our government is? They only look after their own business interest, but never the people’s interest. Many MPs in the parliament hold multiple directorships and they get maximum benefit by having such a policy, directed at suppressing people’s income, so that more money can flow to them. Even NTUC also get millions from government to run for profit businesses from transport, to insurance, to childcare, to supermarket. Where got so much money? From our coffers.. And they get numerous rental subsidises too. Which private company can compete with them? No hope. This government is no hope for the people. PAP is party against people, I say. We must vote it out!!! Thanks for the summary, Huishan. More shoddy statistics and cherry picking from Roy as usual. With regards to employment, you seem to have forgotten the most important indicator – the total unemployment rate. Singapore had a total unemployment rate of 2.9% in 2011 , which is lower than any of the other high income countries that you cited. Singapore’s graduate unemployment rate (3.9% in 2013) is lower or comparable to the other countries (For comparison, Finland’s tertiary unemployment rate was 4.0% in 2011). As usual, trolls with single alphabetical names would come and try to discredit Roy. 1) If you read the MOM report, it says that those who did not find a job within 6 months are classified as “discouraged workers”, and these are automatically dropped off from the statistics. 2) Further, MOM figures is based on a survey sample from the business union. They never use the national data culled from CPF board to track unemployment rate. The figures presented shows too rosy a picture. Could there be a collusion between the business and government to massage the data? Who knows? 3) Who cares if the 2 million foreigners and foreign graduates are employed? What we are interested is the Singaporean employment rate. For a country with 40% of its population comprising of foreigners, it makes no sense to lump Singaporeans with foreigners together. National policies should target to help Singaporeans first. Why are such data always lumped together? Ad hominem attacks? How low. 1) Wrong. MOM says that a worker will be considered unemployed as long as he is still actively looking and available for work. The length of unemployment is not a factor in determining his employment status (http://www.mom.gov.sg/statistics-publications/national-labour-market-information/understanding-statistics/Pages/mrsd-indicators-faq.aspx). In addition, the concept of discouraged workers is internationally recognised and used by other countries as well. 3) Don’t be lazy. Do your homework before complaining. The figure that I quoted for unemployment (2.9% in 2011) is for the RESIDENT population, which consists of Singaporeans and PRs (http://stats.mom.gov.sg/Pages/Unemployment-Summary-Table.aspx#). Roy’s own source (the worldbank) also lists Singapore’s unemployment rate as 2.9% in 2011. 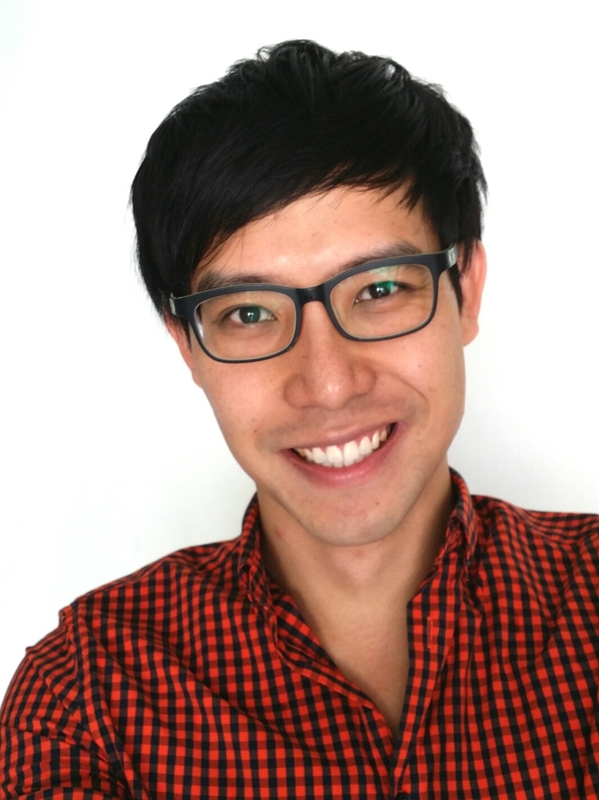 Joy is right – foreigners are most likely employed, or if not, would have to leave Singapore. Thus unemployment figures, when including foreigners in the mix, would necessarily lower the figures, which is then artificial. Yes, Joy is correct. I would like to see the survey result being published on MOM website. What sample size they use. The quedtionaire form. Their survey methodology. Whether those guidelines given by MOM is being followed. Etc. Honestly, I don’t trust what they tell me until I see the data. You cant just pluck a figure and expect us to trust you. Who knows if they survey all foreigners? Is there any check? Who is checking? Can WP ask them to release all the data? What is PAP hiding from us? Why does it refuse to have open data? Could the figures be fabricated? Who knows? I don’t trust anyone. Just give me the data and let us discern for ourselves. What is there to hide? What is PAP hiding from us? I want to know. I don’t trust them at all. The TRS article you quoted claims that unemployment is underestimated because homemakers, retirees and NSFs are not included. However, in economics, the definition of an unemployed person is “a person not currently employed but actively seeking work”. Under this definition, homemakers, retirees and NSFs do not count as being unemployed. This definition is also used by other countries in reporting their unemployment rates as well. (see wikipedia article on “labor force”). So there is nothing wrong with comparing the total unemployment rates of Singapore with that of other countries. I am confused. If these people are not unemployed, are they employed? Is there an in between category that was missed out deliberatedly but sneakily added into the employed category? Or are these people excluded from the calculation of the employment rate? What’s the formula MOM use? Is it in line with other countries? Michelle, these people (homemakers, retirees, NSFs) are excluded from the calculation of the employment rate. They are not considered to be part of the labour force. Please see the wikipedia article on “labor force” for more info. Note that different states, NGOs, and agencies estimate unemployment rates using different definitions and methodologies. Given the dramatic differences in cultural attitudes towards the workforce and working conditions that exist even between Western countries, a definition of unemployment that is both descriptive and objective is possible if the IDU (International Definition of Unemployment) rate is used. The IDU rate simply looks at the definition used in the US and Europe; that is to say if the individual is under 65 and not employed 35 hours a week in a permanent job, they are considered unemployed. The USA has taken this further and ignored the age limit of 65 and merely say “those registered as looking for work”. Questions like how is a part-time job counted, how long until someone is out of the workforce, and the status of subsistence living have not been agreed upon. In short, these figures are not directly comparable. If one simply measures the number of people under 65 who cannot find a job, it is referred to as the IDU rate. The IDU is a base rate that stops Governments of the world doctoring their figures to disguise poor economic performance. One good example is the rate declared in an apparently well-off western country like Australia where the official rate is 5.5 but the actual rate is closer to 30% (Melbourne University Economics Department). The IDU rate in Australia in 1971 was 1.25% and jumped to 27% by 1973 when the Government signed the Lima agreement. The Whitlam Government changed the definition to exclude anyone whose partner was working or anyone with money in the bank or anyone who worked 1 hour a month and thus were able to create the impression of a stable economy. In 2010, ACTU research showed that 40% of all jobs in Australia were casual or part-time, confirming the high IDU rate. Other statistics are equally disturbing in that ASIC records show that Australia has a tax payer base of 11m and 10.8m businesses which could indicate that due to the high IDU rate, everyone has been forced to register their own business. Thus the IDU rate appears to be the only simple definition to be used. That is to say all anyone under 65 has to do is register as looking for work and they are unemployed. What countries are now doing is extending or removing the retirement age limit beyond 65, which could influence the long-term global IDU rate. Sweden for example raised the retirement age to 67 and the US have abandoned any limit completely. Let’s not waste time comparing apples with oranges. Singapore never adopt IDU standard and never open up its employment data. What we should do is to press the government to release those data, then calculate what it is based on IDU standard. I am sure the unemployment rate is higher than advertised by the government. But let’s do this in a proper manner. According to the International Labour Organization, unemployed workers are “those who are currently not working but are willing and able to work for pay, currently available to work, and have actively searched for work”. Singapore defines unemployed persons as “persons aged fifteen years and over who are not working but are available for work and are actively looking for a job during the reference period”. So there is little to no difference between the international definition of unemployment and the definition adopted by Singapore. Is working $1 per day considered employed? Is working part-time considered employed? Is working on and off considered employed? These under-employed people plus those discouraged workers should be included but are not captured in the data. And, as Asians, when it comes to survey, we tend not to be honest about our situation, especially when we are not employed. It is important that the data presented reflects accurately the situation of employment in Singapore, and not masked by some rosy figures derived by a quasi government agency. Do you have any references on that particular definition of unemployment? I went to the wikipedia article where you took your quote from, but there aren’t any referenced sources of information. From what I know, both the US and the EU are using the ILO definition of unemployment in reporting their unemployment rates. The ILO definition is used by many other countries as well, which is why we can compare unemployment rates across different countries. I agree that the ILO definition isn’t what the general public would think of when they think of unemployment, but if everyone else measures and reports it this way then I don’t see a problem with it. @K, as you can see from the Wikipedia quote, it says . I also tried searching for it but couldn’t find the actual source online. I see this as a big problem and that is why I suggest let’s not bother about what rosy figures each country report. It is meaningless to compare something that in itself is meaningless. The current definition of unemployment mask the actual situation of hidden unemployment and underemployment. The fact that your definition of unemployment has no citations raises a red flag to me, because it suggests that this definition is not used by other countries. However, the ILO definition of unemployment which I cited has many references and is used widely. I agree with you that the ILO definition has limitations because of undercounting. This is why economists also use many other statistics to determine the health of the labour market, such as the total number of full-time jobs and the labour market participation rate. However, that does not mean that the total unemployment rate is a meaningless statistic, because every statistic will have its own limitations. It is still an important indicator of the ease of finding a job. I can say that Singapore’s total resident unemployment rate of 2.9% is low because it is low compared to other countries (and every country calculates it the same way), not just because it sounds “rosy”. If the unemployment rate rises to 7%, I will say that it is high, because it is high compared to other countries, even though it still sounds like a “rosy” figure. The ILO criteria is very subjective. 1) How do you define willing to work? I am willing to work if the hourly rate is $10, but forget it if the rate is below $5. Am I considered willing to work or not willing to work? 2) How do you define able to work? My right hand is injured, I can’t write, but I can still type with my left hand. Am I considered able to work? 3) How do you define available to work? I am available to work between 9am to 5pm. Forget it if your security firm wants me to work the grave yard shift. Am I available to work or unavailable to work? 4) How do you define actively searching for work? I spent the whole of last week searching on jobsDB, but can’t find a suitable job. I want to take a break before searching again. Am I considered actively searching for work? There is a big room to play around with this ILO unemployment rate figure. I would say the result is too subjective to be worth the time surveying. I don’t care what other countries do. Why don’t our government publish the employment data along side whatever it wants to publish? Interested parties including economists and academics can make use of the data to derive IDU or whatever measurement they want. Then, there would not be so many arguments like whose interpretation is correct since everyone would be able to use the data to form their own conclusion. It would also help improve trust between the government and the governed by doing things openly and transparently. I am sure employment data is not something like a top secret that needs to be closely guarded. Can you find me an example of a major country that calculates and reports your so-called IDU unemployment rate? I tried myself but I couldn’t find any. I also don’t understand why you are so fascinated with this IDU definition that nobody else uses. Think about it, what information would it tell you that isn’t already available from other statistics? If you are concerned that Singapore has too many NSFs/homemakers/retirees, there are surveys that tell you the approximate % of people in these categories. You can also look at the labour force participation rate to see the % of people with a job relative to the total population. If you are concerned that a lot of people are in temporary jobs with low incomes, you can look at the income levels of the country. I think you completely miss the point I am trying to say. I am not so much concern about IDU unemployment rate but more concern about the lack of published data tfor anyone to make an objective assessment about the overall situation in Singapore, in terms of Singaporean unemployment, underemployment, income levels, etc. If you say these data are readily available, where are they? Is it sufficient? Care to point me in the right direction? I would like to assess these for myself, as a concern citizen, wanting to know more about the well-being of my fellow citizens. Hey, the way Singapore computes it’s budget surplus is already inconsistent with other countries. Otherwise, the surplus will be billions more. IMF reports our surplus to be 10 times higher than what our government report. I don’t understand your charts 1-4. As your graph has stated, the percentage is for % of unemployed tertiary students out of total unemployment. So, considering that our overall unemployment is at 2%, compared to the 6%-9% (or even higher in many European countries), we are okay in that respect no? I went to see the document for myself, and the breakdown for primary, secondary and tertiary is 27, 23 and 50, which adds up to a 100%. So while yes it seems like 50 % of tertiary students are unemployed, it is actually only 1% (by rough estimates) of the entire working population that are unemployed and are tertiary students. The breakdown of percentages that you provide only shows the educational profile of the people who are unemployed in Singapore, and as you mentioned there is a sharp increase of tertiary students over the past few years which could explain this shift in proportion. You hit the bull eyes, not like some people who blindly follow what the propaganda material said. Regarding the increase in % of unemployed having a tertiary education, the trend can actually be completely explained by looking at looking at your chart 8. In order to see how much of the increase is due to factors other than population change, you simply have to take a look at which segment of the population in chart 8 will have entered or left the workforce from 2004-2010. In this case, the population in the 60-64 bucket and the 65+ bucket would have left the workforce, and the population in the 25-29 and 30-34 bucket would have joined the workforce. 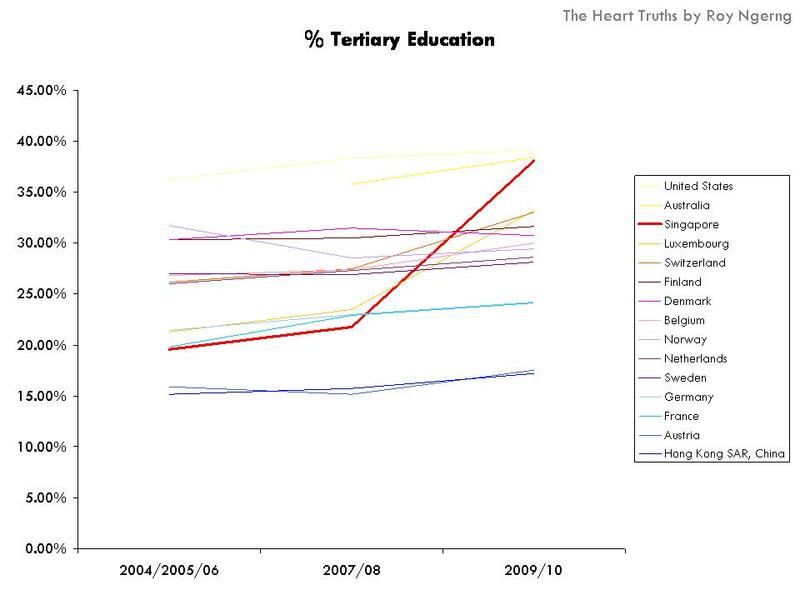 Just from eyeballing the 4 bars, we lost a workforce that was about 5-10% tertiary educated and gained a workforce that was 45-50% tertiary educated. 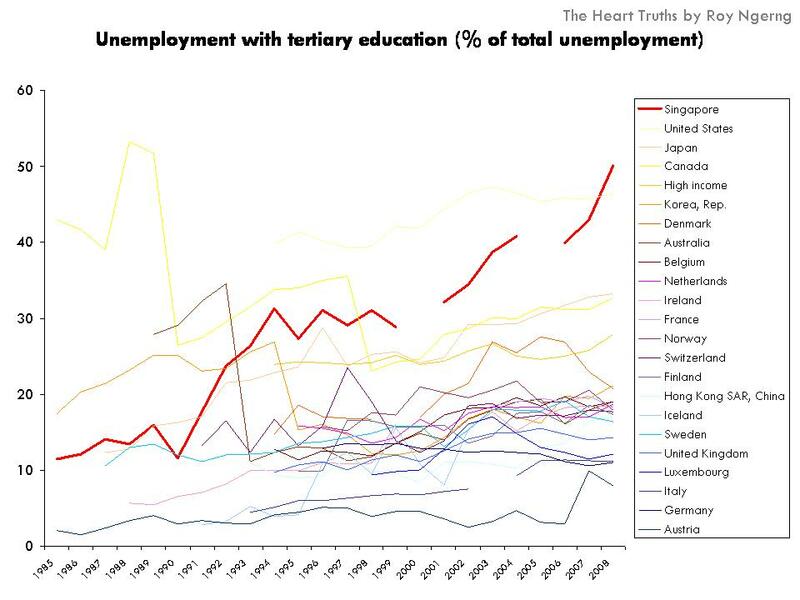 That’s a 10 fold increase, but the % of unemployed that had tertiary education doubled roughly. I concede that this was a quick and dirty way to compare the numbers, but I believe that more or less explains the increase in tertiary educated unemployed. You completely leave out the non-Singaporean workforce in your statistics – and they account for 40% of the workforce, which is a significant amount. Come back when you have done so. 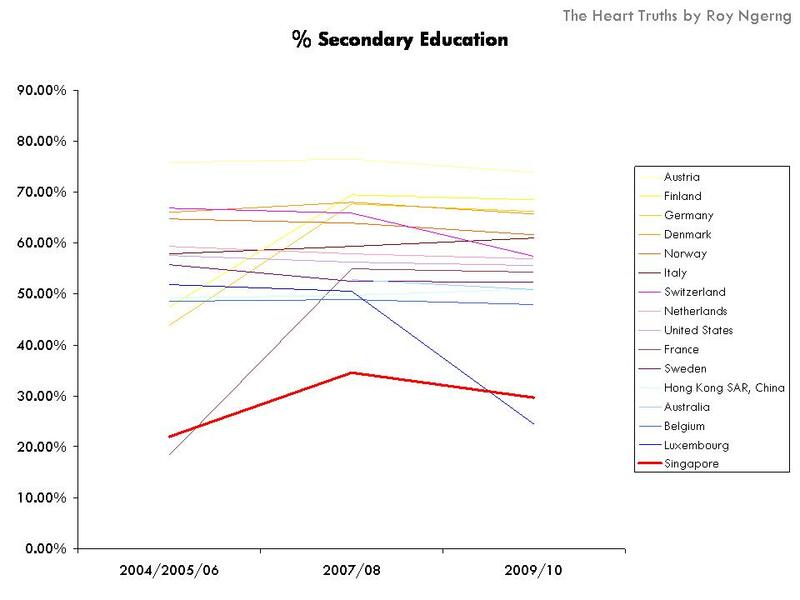 Kim was citing data from your own Chart 8, which is the “Educational Proﬁle of Singapore Resident Non-Students, 2002 – 2012”. These are resident non-students, hence non-Singaporeans don’t come into the picture. Thanks for your excellent writing about REALITY in Singapore and I find them very informative and disturbing and becoming over concern about our future if these policies go unabated. I would strongly suggest you compile all your writings and publish them into a book especially for those without Internet access or usage if you do not have plan of compiling into a book. Date each and every article and have it a year before the next GE.! I saw your name in the mailing list for I LUV SG group and look forward to meeting you. I will see what I can do – to create a book, as you had mentioned. If other readers might have any leads on this, do share as well! Chart 16 is powerful but it does not necessary imply that getting a degree or grooming more Singaporeans towards a degree education would increase the innovation index of our workforce. Chart 1-4 – Numbers represent % of total unemployment and not % unemployed out of total. Geez don’t fool people into believing 50% of graduates are unemployed! Chart 12/13 – Khaw did not tell you not to go to university, he merely remarked that there must be matching jobs and there are many jobs that DON’T require a degree, Also you speak as if wages are controlled by the govt but in fact they are NOT. It is a meritocratic system… you have the right qualifications, experience and stand out from the crowd, you get the pay and job! There is no other way to climb the ladder in Singapore other than being hard working and motivated. Don’t blame anyone else but yourself! I was a poly graduate who bridged the income gap with my graduate colleagues and doing better than many of them. It’s possible… question is how much are you willing to put into it? One key thing we need to do MUCH better is our education system. I liken it to an efficient distribution center where grades are the common benchmark. You get streamed at almost every other year during the first 10 years of receiving education. If you do badly at Primary 6, you will have very little opportunity to climb out of the ‘low education, low wage continuum’ in the future. But what if it was a blip? What if you were a genius who just did not like studying at 12? We need to revamp the system, so everybody has a shot at excelling over a longer period of time. Chart 16 – which page of the global competitive report did that chart come from and how does the poor score of 13.9 corroborate with SG rankings on page 341? It looks like we rank between 2-18 for various categories of innovation so are you taking readers for fools?? Has anybody thought about this… if there are too many foreigners here squeezing singaporeans out of the job market, why is our unemployment rate still so low? Numbers don’t lie do they? Roy, even as a Singaporean sitting on the fence (politically speaking), I abhor your desire to either misquote or speak half-truths… and don’t analyze anything if you are incompetent at it! Also don’t confuse people by dumping one too many charts at them and hoping the numbers along with weak logic will stick… your content basically does not explain your opening remark… poorly written! Actually, numbers do lie… Please refer to Joy Wong’s comment above regarding our employment rate. Like those City Harvest church goers, the 60% have their blind faith placed on the PAP government. You sound like one of them. (1) Other high-income countries have higher enrollment rates in the universities – to allow all citizens to learn more, and earn more across the board. (2) Other high-income countries pay their workers higher wages across the board, regardless of their educational levels – Singapore pays the lowest wages to its workers, and even lower when one doesn’t have a university graduate. (3) Other high-income countries have much smaller differences in the wages of those with different educational levels – Singapore has the largest wage gap between the workers of different educational levels – $1,000 difference between a university and polytechnic graduate would have been thrown out, rallied against and narrowed in these other countries. (16) Chart 16 – not ranked, it’s rated. You are not sitting on the fence – you’ve already taken a stand. Please read the article as a whole – the aim is to have the larger picture. Your dissection is misleading and readers should discern for themselves. No, getting a degree would not increase the innovation of the workforce. This isn’t the point of the article. The point is that university education and the education system as a whole needs to be restructured to allow for higher critical thinking skills among Singaporeans. We all know that the statistics are incorrect. They mixed newly awarded PRs and Citizens with Singapore born citizens. It is definitely inaccurate. Just take a look at our original population before we needed “foreign talent”. We were sitting on the fence between 2 and 3 million people. 10 years later, our population became 6 million. As far as I know, this is the only country in the world that allow the same number of foreigners as its people to share our land. It’s a 100% increment!. And now, they want to make it 6.9 million??? 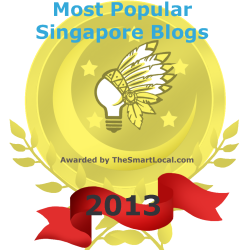 When that happens, we true Singaporeans will become the minority! Where then do we stand?? 3rd or 4th class citizens?? No wonder the children or our ministers are living in other countries. Its better to be 2nd class citizens there then be 4th class citizens here. As for Singaporeans being unemployed, government agencies should set up career counceling servicies to guide the unemployed on what courses to take that will result in better employment and better pay. On top of that, these agencies should liaise with companies to employ them as mid-career PMETs.. What the WDA and E2I are actually doing now are just plain lip service. There is no real effort to train our citizens to be better qualified, and even if they did, the starting salaries for these PMETs after conversion are below those of fresh graduates. That is really ridiculous! These PMETs have years of working experience before their jobs were taken away but somehow, it meant nothing to the employer. heh. actually the problem will resolve it self in 30-40 years. We are all 2nd or third generation anyway. in 30-40 years, all the kids of the FTs will be exactly the same as we are, probably also complaining about the same things. They will be ‘true’ singaporeans too. . So no we wont become a minority. yea, sgreans were all from china, india, msia last time… after one generation they become sgreans .. altho the culture not sure will dilute or not.. So anyone has a feasible plan to tackle the problem about foreign competitions for jobs here in Singapore? I have been surfing online more than 2 hhours today, yet I never found any interesting article like yours.